I've been always admiring those devoted knitters. They create beautiful arts with yarns and sticks, which amazes me with their endless capability. Gee most of them knit a lot with the speed of light as well. They seem so enthusiastic and look very happy with what they are up to. I'm not an authentic knitter but they so often make me feel like knitting, so badly, by showing me their world. That's why I pretended to be a knitter and knitted this little jacket. And I even started another knitting project too. While knitting, I often wonder if hobby sewists can make people feel like sewing in the same way as hobby knitters make me feel like following them. ...well, that said, I don't know if I'd want the answer. Because it is a silly question. And that doesn't matter. That doesn't matter at least to me and to my sewing at all. Still, if it happens, it is lovely. Imagine there are positive influences everywhere. 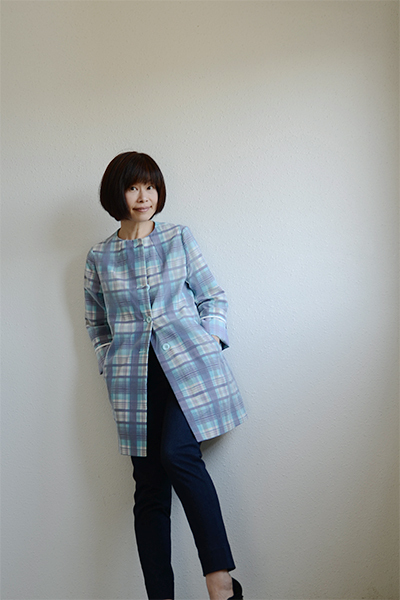 I recently sewed a coat and a pair of knit pants for autumn. Yay for the cooler weather! The fabric I used for the coat is something very special, as well as somewhat peculiar, I describe. It was basically a double layered fabric which had a slightly sparkling nylon organza covered (totally and throughly glued) over a base fabric of blue-ish plaid stiff polyester that would remind you of parachutes. 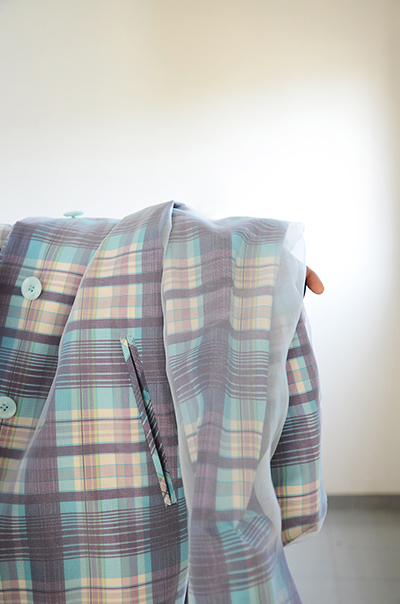 The fabric is meant to be soaked in the water after sewing, for the purpose of washing away the glue, and then is expected to have separate layers of organza and plaid in its end products. Though it was very stiff like a cardboard before washing(no exaggerations), I thought it would make a pretty jacket/coat that I can use as a windbreaker. 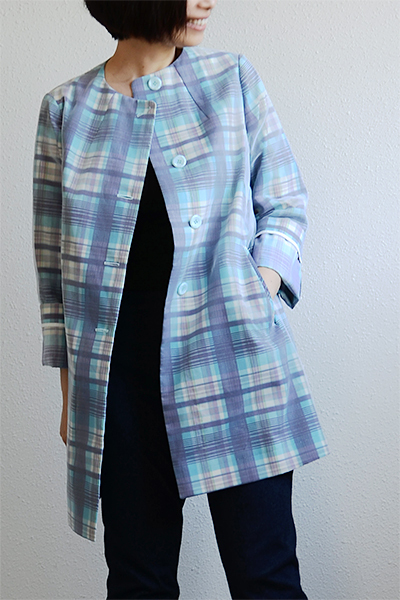 A pretty plaid coat fully covered with sheer organza for windbreaking-purpose! It sounded pretty exciting to me. The construction of the coat was not so difficult and done quite smoothly despite of the cardboard quality. I used my usual pattern for very plain boxy half coat, and just omitted the collar and lining to make it even simpler. 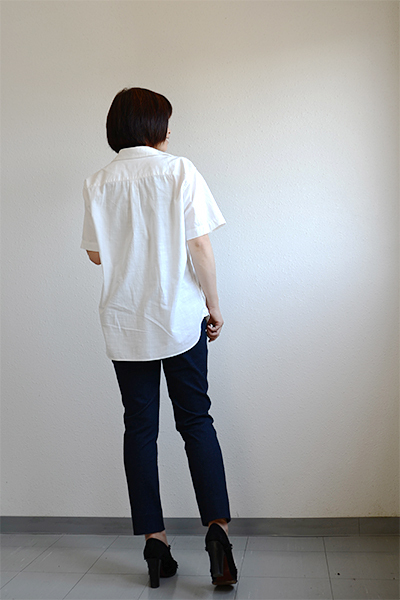 I think I could have those sleeves shortened by about 10cm/4inch, design-wise. Having said that, I'm wearing it with rolling up the sleeve hems as in the pictures and will be doing so whole this autumn anyway. I'd leave the sleeves as they are, since the contrasting piping in my rolled-up sleeve hems may amuse people's eyes by the whiteness. My previous coats from the same pattern can be also seen in this post. I really like the pattern, because these pants are quite pants, but not leggings! Some are really good at pulling off leggings, but I usually prefer pants on me and I'm so loving this pattern from this point of view. I hope you can see that they are pants but not very leggings in this photo below. collar and lining were omitted. most hems were executed with contrasting bias piping. fabric: polyester/nylon blend. very synthetic. stiff. mid bodied, not very flexible, light, fairly creaseless. consists of a plaid polyester plain woven fabric and a silver-white sheer nylon organza. shortened the crotch height by following the lines that pattern indicates, and shortened the legs by about 3cm as well. fabric: cotton denim knit fabric. dark indigo blue. stretches moderately. thick. hard. heavy. Once in a while, directly or indirectly, publicly or privately, I get sort of requests for showing my sewing environment. Reluctantly saying, I've never be great on responding them. 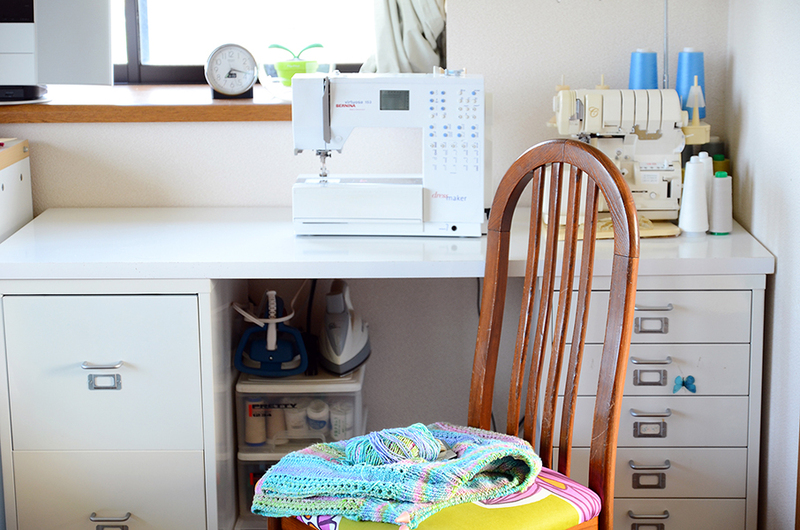 The thing is, my sewing space is too humble to show off. You have to guess me as a single geek sewing in a small corner of a tiny family room with a weird grin on her face. Next to this small bench, I have one rather big folding ironing board that I bought at a thrift store for 100yen 8years ago (this was eyeballing cheap because its electric socket was broken, but I had no problem with replacing it by myself of course. Being geek is cheap.) And some fabrics. And this is all. I hope you have a very lovely weekend! For those who are interested in sewing gear, I use Bernina virtuosa153 dress maker, Babylock BL75, T-fal aquaspeed and unused Mire supersteemer. Therefore I have straight stitches, zig-zag stitches, blind hem stitches, button holes stitches, overlock stitches, cover stitches, a steam iron, and a backup iron for T-fal's sudden breakdown, in the corner. Today my dh and I visited Pola Museum of Art and enjoyed the special exhibition devoted to the work of Claude Monet and his contemporaries. 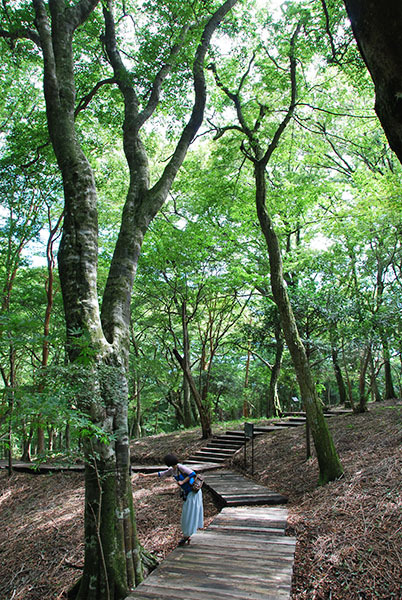 I love this museum which locates in a thick and beautiful forest of Hakone and owns a superb collection of Impressionist art. I was wearing a tweed skirt which I made some time ago, so I took a chance for photographing it against unusual backgrounds as well. This is just another (tucked) elastic waistband skirt, and I have almost nothing to say about it... but I really like it at all. 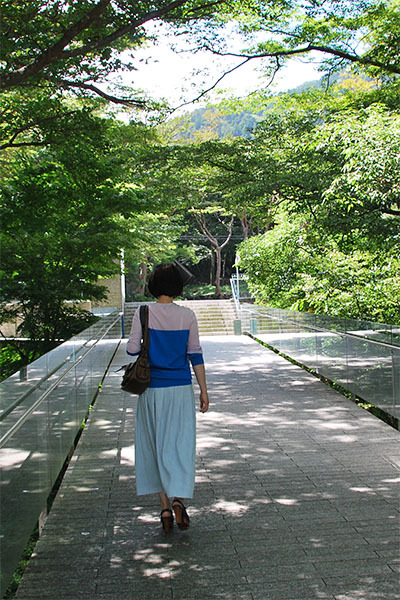 The museum opened a promenade in its backyard (practically, the backyard is a genuine natural forest) some months ago, and of course we had to check how it was too. 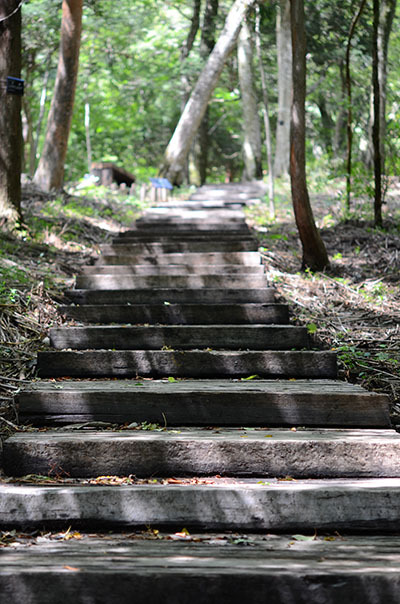 It was simply a quiet woodland with a lovely promenade. We really loved it at all. By the way, I am an audio guide mania, you may see it in the pics. That is one of the wonderful inventions of human beings, ever! lined. lengthened by 10cm(4 inches). fabric: Cotton tweed. blue and white, dry, flow-y, light and soft. The blog post for my first elastic waistband skirt from the same pattern is, here.